After the end of Space War I, the VF-1A continued to be manufactured both in the Sol system (notably on the Lunar facility Apollo Base) and throughout the UNG space colonies and had a long service record. One notable operator of the VF-1 was the U.N. Spacy's Zentraedi Fleet, namely SVF-789, which was founded in 2012 as a cultural integration and training squadron with two flights of VF-1 at Tefé in Brazil. This mixed all-Zentraedi/Meltraedi unit was the first in the U.N. Spacy’s Zentraedi Fleet to be completely equipped with the 1st generation Valkyrie, while other units, like SVF-122, even though made up exclusively from Zentraedi loyalists, kept a mixed lot of vehicles. SVF-789’s flight leaders and some of its instructors were all former Quadrono Battalion aces under the command of the famous Milia Fallyna, later married with Maximilian Jenius, a U.N. Spacy ace. 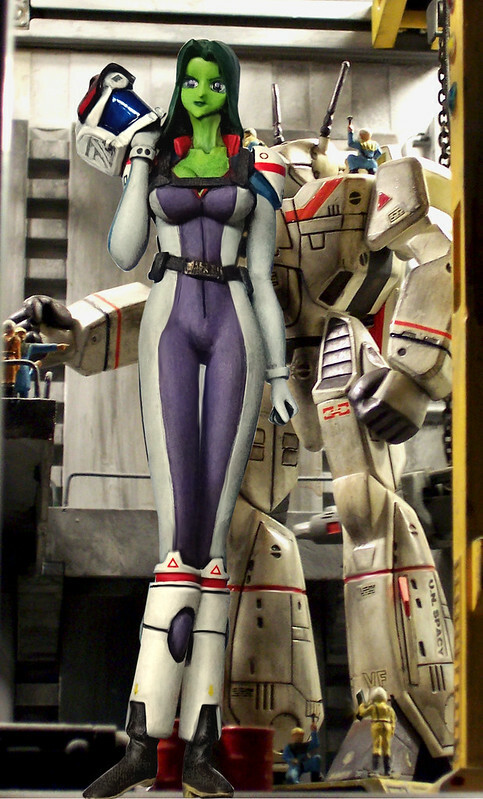 Meltraedi (female of the giant race of warriors known as the Zentradi) pilot Taqisha T’saqeel was a founding member of the squadron and commanded SVF-789’s 3rd Flight. Almost all future Zentraedi and Meltradi pilots for the U.N. Spacy received their training at Tefé, and the squadron was soon expanded to a total of five flights. During this early phase of the squadron's long career, SVF-789's VF-1s carried a characteristic, dark-green wrap-around scheme, frequently decorated with colorful trim, reflecting the unit’s Zentraedi/Meltraedi heritage (the squadron’s motto and title “Dar es Carrack” meant “Victory is everywhere”, reminiscent of the alien race's martial heritage with a strong warrior and honor codex) and boldly representing the individual flights. Taqisha T’saqeel was an ace Quimeliquola Queadluun-Rau power armor pilot, originally serving on board an all-female ship in the Lap Lamiz fleet. Taqisha was a self-confident and intelligent officer, and she stood out among other Meltradi through her relatively short size (5' 3.5"/162 cm micronized) and petite figure - even though she compensated for her lack of physical presence through cunningness and a very good tactical understanding. 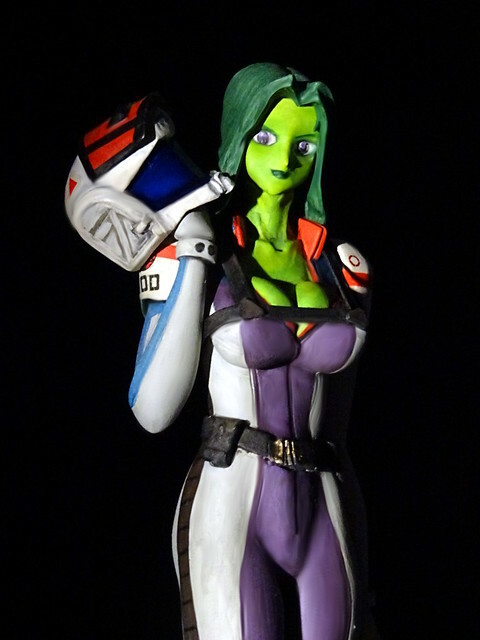 What made her stand out even more among her brethren was her bright green skin (not unusual among Zentraedi and Meltraedi, but rare in this intensity) and her deep sea green hair. 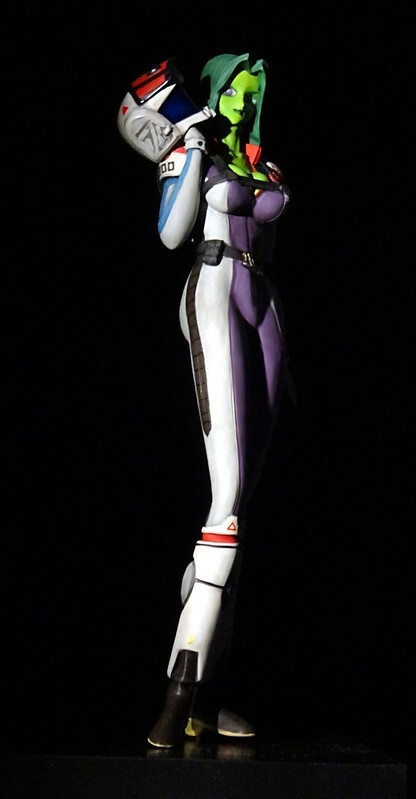 During the confrontations with the "Miclones" of Earth, and their spacecraft, the SDF-1 Macross, she more than once was involved in direct confrontation with U. N. Spacy forces. After the end of hostilities in 2012 she met her former commander (and now married), Milia Fallyna Jenius again, who had become micronized and had been allowed to become a member of the U.N. Spacy in her own right, now piloting a red-painted VF-1J Valkyrie Fighter into battle as her husband's wingmate, became fascinated by both the human race and the outlook to carry on here military career, for the sake of her own race (as well as her male Zentraedi brethren) who found themselves stripped off of their warrior "raison d'être". 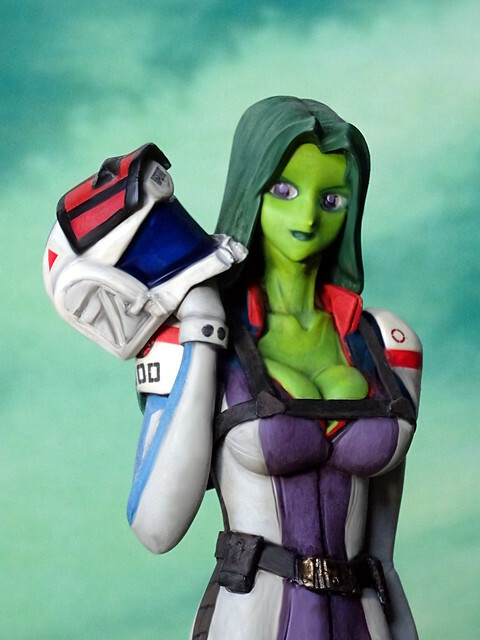 When the U.N. Spacy offered both former Zentradi and Meltraedi soldiers to join Earth's forces and create integral squadron, she was quickly willing to take responsibility and became one of SVF-789's flight leaders in late 2012. In late 2013, SVF-789 embarked upon Breetai Kridanik’s Nupetiet-Vergnitzs-Class Fleet Command Battleship, and the unit's VF-1s received a standard all-grey livery, even though some typical decoration (e. g. the squadron code in Zentraedi symbols, as well as some garish trim in green, blue and violet) remained. When the UN Spacy eventually mothballed the majority of its legacy Zentraedi ships, the unit was re-assigned to the Tokugawa-class Super Dimensional Carrier UES Xerxes. In 2022, SVF-789 left the Sol System as part of the Pioneer Mission. By this time it had been made part of the Expeditionary Marine Corps and re-equipped with VAF-6 Alphas.